Why is website visitor tracking important? Maintaining an orderly track of the visitors to the website is an important and integral part of B2B Marketing initiatives. According to some studies, almost 97% of the website visitors are anonymous. This means that at any given point of time we do not know who these visitors are and what they are looking for. The goal here is simple – to know the number of visitors who are reaching your website and understand what they are looking for and how much time they are spending on your website. It is equally important to understand where the traffic is coming from. 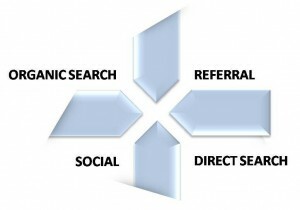 Together these contribute in achieving success in Online Marketing space. No matter which Marketing Automation system you use, it is always important to know which day of the week is the busiest in terms of traffic, and what kinds of keywords people are searching to arrive at your website. One should also track where and how the traffic converts to sales leads, and where those leads come from. Moreover, it will help you in tracking your competitors. Visitor Type Analysis: The top level metric most webmasters obsess over is traffic, specifically total number of visits to a website. Total visits can be broken down into unique and repeat visits – unique visits tells you how well you attract new visitors, while repeat visits tells you how well you retain visitors. Search Term Analysis: This report provides you information on what term has been searched by the end user to get on your website page. Similar to this, we also provide a report on Search Word Analysis that basically provides report on searched word. Social Media Analysis: We can track visitors coming via social media as well. With this information, you get a great sense of the importance of social media for bringing people to your site. If you ever need justification for focusing on social media, this is what you should be looking at! Top Referral URL Analysis: Another important piece of information you should consider is the Referral URL. That’s the page on which someone clicked a link that brought the visitor to your site. In addition, we track Referral Domains. Top Current URL Analysis: Like above, we break down the count on the basis of current URL as well. Hour of day Analysis: We also track the information at what time the most of the leads visited your website. We can break down the count on the basis of hours and contact type like for known contacts, unknown contacts and etc. Moreover, we provide Country based Traffic Analysis, Region-wise (like US & Canada) Traffic Analysis, Top Entry & Exit URL Analysis, Top Account Analysis, Search Engine Analysis, and Top ISP Analysis. traffic from search social media which is called Social. Checking these traffic sources individually will give you a clear idea of how effective each marketing activity or campaign has been and help you identify where you should be intensifying your efforts. » IP Address Tracking – Do you need to know who is visiting your website based on their IP addresses? Need to find out what a visitor from a specific IP address did on your website? This is possible. RightWave’s metrics are powerful to differentiate between an ISP and a Company. That is again something you should definitely be looking at. Our reporting system keeps a track of every person to visit your website, based on IP addresses, giving you access to a complete and permanent record of activity-per visit. Once you have a user’s IP, you can begin the process of tying the visit to more personal information about the user. The European Union adopted the General Data Protection Regulation (GDPR) in 2016 to strengthen and unify the protection of individuals in European Union and also regulates the transfer of individual data outside the European Union. While implementing any kind of web tracking with the European Union, it is important to understand the intricacies of this regulation that can be read in detail at the following link. A future blog post in this series will have a detailed outline on how this regulation impacts businesses and how you can safeguard your interests. Marketing organizations can now enjoy flexibility and market intelligence using popular marketing automation and CRM tools. RightWave also provides a basic Marketing Automation system if desired. RightWave’s Marketing Automation as a Service™ (MaaS) frees up marketing executives and managers to focus on strategy and content while RightWave handles all the details of campaigns, database management, and reporting. The company can also plan, manage, and implement marketing technology projects of any size. For more information, contact RightWave.